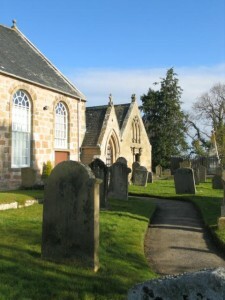 We worship in two beautiful buildings in Moray at Edinkillie and at Dyke. 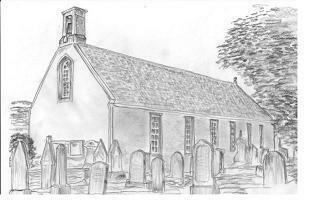 Beautifully situated on the banks of the river Divie 9 miles south of Forres on the A940 Forres to Grantown-on-Spey road you will find Edinkillie Parish Church. It was built in 1741, improved in 1813 and further extended at a later date. The external walls have been harled and cream washed, making its irreggular shape more attractive. Internall y the church is bright and pleasing to the eye. The traditional 18th century style with central pulpit and galleries on three sides has been retained. A baptismal basin was gifted in 1886 by Mrs Livingstone-Learmouth in memory of her grandfather, the Rev. Alexander Coull, who was minister at Edinkillie from 1745 to 1790. The Bruce family presented the church with a commmunion table in memory of their son who was killed in action in1941. A beautiful pipe organ was gifted by Sir Robert McVitie Grant in 1943. As recently as March 2012 two circular windows were replaced matching the early original windows. One window was gifted by the Reid family in memory of Wm. R. Reid, Session Clerk 1980 – 1996. Our other building is located in the village of Dyke, situated near to Forres in the beautiful county of Moray in the North East of Scotland. It is in the sheltered Moray Firth area between the mountains of the Highlands of Scotland and the Grampians in the East. The origin of the name Dyke is Gaelic for dig signifying drain or ditch. The village has its own Primary School where our Minister acts as Chaplain and visits every week. We are close to Brodie Castle, Culbin Forest and The River Findhorn. It is also near to Macbeth’s Hillock thought to be the meeting place where Macbeth met the Three Witches in Shakespeare’s play. A few miles inland it enjoys the benefits of a microclimate often mentioned on national weather. The present Church was built in 1781, is listed and stands on the site of an earlier building. Our congregation is a healthy mixture of ages and drawn from over a wide area. Visitors are made very welcome and invited to share fellowship over a cup of tea in the hall after the service.